The Rhonan Grande pendant by Tech Lighting is the epitome of modern with its asymmetric stamped metal shade and matt finish color options. 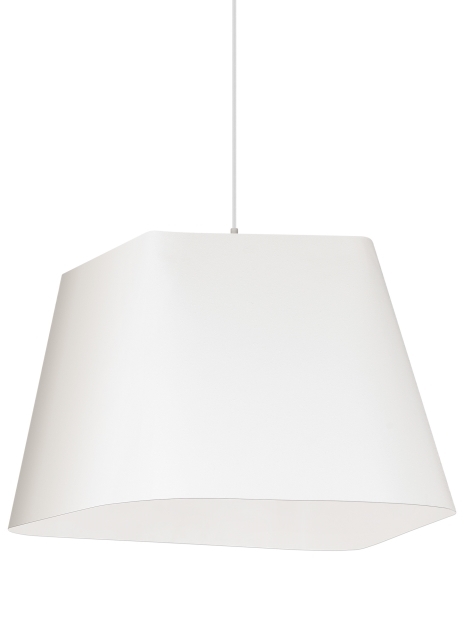 The stamped metal shade undergoes a unique treatment process to add a natural rough cast texture, then is painted with your choice of matt finish to yield a dramatically modern pedant with unexpected scale. The Rhonan Grande is available in two on-trend finishes, textured black and textured white. Available lamping options include energy efficient LED or no-lamp, leaving you the option to light this fixture with your preferred lamping. The Rohnan Grande scales at 12” in height and 18.9” in diameter making it ideal for living room lighting, dining room lighting and a host of commercial lighting applications. Rated for (1) 75 watt max E26 medium base lamp (Lamp Not Included). Includes 120 volt 19 watt, 777 delivered lumen, 2700K medium base A21 LED lamp. Dimmable with most LED compatible ELV and TRIAC dimmers. Fixture provided with six feet of field-cuttable cloth cord to match finish collection.